LambdaConf’s response to the feedback. We need your help! I will explain what I mean by that in a second, but first, I ask that you keep the contents of this email confidential until we have collected all feedback and make a public announcement about whatever policy changes come from your feedback. Since you’re reading this, I’m sure you know what the letter was about. The organizers of LambdaConf 2016 had inadvertently “accepted a speaker who was uninvited from StrangeLoop” last year. That speaker, of course, is Curtis Yarvin, a.k.a. Mencius Moldbug. One of our staff members spent half a dozen hours poring through blogs, articles, and videos — all first-person sources (which is important). He believes that democracy is a failure (incompatible with “freedom”), and that white male software engineers are most qualified to run “government”. Indeed, LambdaConf’s appraisal of Moldbug might have been “erroneous or out-of-date.” What I found unsettling was how generous this appraisal felt – as if to convince us that Yarvin isn’t a bad guy, just somehow misunderstood. The entire letter reads this way. Let me say this unequivocally: Yarvin chose to produce this controversy. This is not an accident. He is not a pitiable figure who is persecuted for his beliefs. He is not simply an eccentric functional programmer who, like you or me, happens to hold a couple of beliefs out of the mainstream. Nope. Yarvin’s hobby is writing hateful things, publishing them, and cultivating a movement of hateful people working toward hateful ends. This controversy serves those ends. He knew when he submitted his proposal that, if accepted, he could count on at least a brief flurry of interest in his ponderous, indulgent treatises. That was all he could get from StrangeLoop before he was unceremoniously dropped from the program. But despite the mess that he has put them in, LambdaConf’s organizers feel that he deserves more consideration than he received from StrangeLoop. Our feedback was requested via a two-question multiple-choice survey (with only small input boxes for comments). Only women and minority speakers were notified of the issue and asked for feedback. The first point was frustrating, for sure. In De Goes’ liberal formulation of a conference governed by “neutral” and impersonal rules, he asked us to choose between meager alternatives: Did we prefer a code of conduct that covers only behavior at the conference? Or one that requires all conference-goers to adhere to some set of personal beliefs? How about a code of conduct that applies to all behavior, everywhere and all the time? De Goes had resigned himself to a narrow set of unappealing choices, and we had to type furiously in little boxes to present the possibility of seeing the issue another way. But the second point is damning. LambdaConf believes that it is fair for speakers to contribute unpaid labor to resolve the problem of Yarvin’s inclusion – a problem that results from Yarvin’s many egregious public writings. So who did LambdaConf appoint to contribute this labor? Only the people whom Yarvin has made a pastime of attacking. This isn’t hyperbole. No other speaker has made the choices that Yarvin has. No other speaker has chosen to author reams of racist diatribes. No other speaker is in Yarvin’s position; us normal folks – we’re good with just having our proposals read and judged on merit. We don’t need special consideration because we haven’t spent our free waking hours advocating for slavery. Instead of holding Yarvin accountable for his personal choices, LambdaConf chose to accommodate him. Since accommodating Yarvin comes with a cost, who better to pay it than the objects of his hatred? It took me much longer than I’d wished to decide how I would respond. In fact, it took me much longer than I’d wished just to read the whole letter. De Goes’ email goes on for pages; it’s over 2700 words long. It arrived on a Thursday afternoon, at the same time as an urgent feature request, the day before a make-or-break last-ditch job interview. The same day, apparently, that this happened. What was worse was that I couldn’t tell anyone about it, least of all anyone who could help. De Goes asked for confidentiality; as a trustworthy person acting in good faith, I felt that I had to respect his request. But I desperately wanted and needed help. I had many ideas knocking around in my head, some of them very sympathetic to De Goes. LambdaConf wanted the honest feedback of women and minority speakers, but why assume that each of us would provide our best thinking in a vacuum? I wished that I could at least confer with others who had received the email. As a newcomer to this community, I had no idea where to turn. On Sunday, I took my daughter to my parents’ and finally had a moment to think. Finally, the Tasmanian devil was out of the house. I was concerned that if I didn’t respond in this brief window of relative calm, I might never at all. And I felt that I had to speak up. Unfortunately, I didn’t have the foresight to screenshot the questionnaire or save my responses before I submitted them. Some of my feedback was quoted in LambdaConf’s eventual reply, so I can provide verbatim at least some of the text that I wrote. My remarks are in italics here, here, and here. LambdaConf has no responsibility to spend costly resources or damage its reputation on behalf of people who engage in destructive behavior. Prudence dictates a practical and expedient decision. 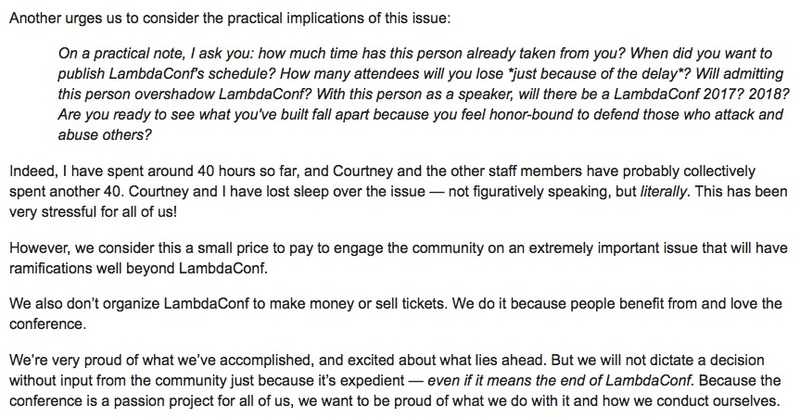 LambdaConf’s Pledge of Conduct is not meaningful when taken by someone who won’t stick to their word. To a dishonorable person, a pledge that all attendees take only serves as cover for malicious plans. While LambdaConf cannot reasonably be aware of every attendee’s behavior everywhere and at all times, behavior that is public, chronic, and unresolved should be considered as potential grounds for exclusion, because it can demonstrate untrustworthiness. LambdaConf is a private event convened by and for a community that cannot exist without mutual trust; it has a responsibility to protect its community from untrustworthy actors. It takes many trustworthy people to build up a community, but only one or two untrustworthy people to destroy it. I gave my permission to be quoted anonymously, and I opted to identify myself as well. Doubtless, you are aware of De Goes’ decision. He wrote up an explanation and defense of it here. Prior to releasing the blog post, De Goes wrote back to our feedback. The response letter and blog post are similar. At the moment, I don’t have a lot to add to the critiques that are already available, but I may later edit this post to link to those critiques. I’m brand-new to functional programming. Hell, if you count by years in the industry you’ll see that I’m almost brand-new to software development. I don’t live in a “tech city.” Far from it. I don’t work for a company with a conference budget. Since functional programming isn’t part of our tech stack at work, I receive no support from my employer to attend an FP conference even if I am speaking at it. I turned down an enthusiastic invitation to speak at Lambda Days 2016 in Poland simply because I could not afford to go. Hence, I was overjoyed to be selected to speak at LambdaConf 2016. Why? Because LambdaConf commits to providing speakers with accommodation. Because LambdaConf welcomes presentations on beginner-level subjects. Because everything I had read about LambdaConf for a full year seemed to indicate that they were doing everything right, from childcare and diversity scholarships to partnering with associated mini-confs to fostering an atmosphere that attendees raved about. Until he committed to a decision that may end LambdaConf for good, De Goes was onto something. For me, the quandary is, “If I don’t take this opportunity now to build relationships in the functional programming community, when will I have the chance again?” When will I have another shot at a cheap trip to an FP conference? When will I be asked to speak on an FP topic again? But then, I think, do I really want to be at this conference if all of my people – people who care deeply about justice, equality, freedom, and compassion – won’t be there? How will I feel when I’m there? Uncomfortable and unable to participate to the fullest? A few days ago, I was naive enough to think that, even with Yarvin on stage, LambdaConf would be overwhelmingly full of people who completely oppose him. Now that so many have dropped out, I’m just not sure if that’s the case anymore. But then, what about others like me? I know at least one other person who deeply opposes Yarvin, but will attend LambdaConf 2016. 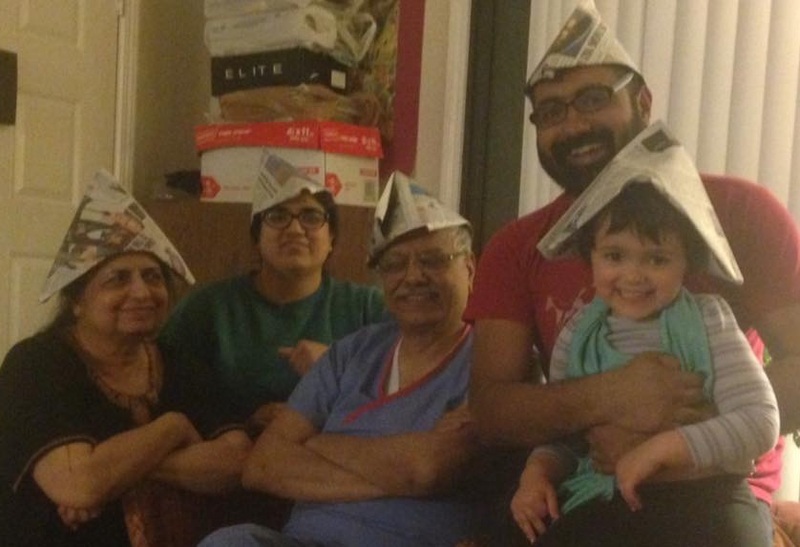 Can I bear to leave them there alone, when I could be there to stand with them? There’s only one thing I know for sure: the joy I felt at being selected to speak at LambdaConf has entirely dissipated. If I’m there, I expect to feel like I’m there because I need to be, not because I want to be. In the meantime, I fully expect writing this talk to make me feel sick to my stomach.